Homebirth in Australia should be a right for women. 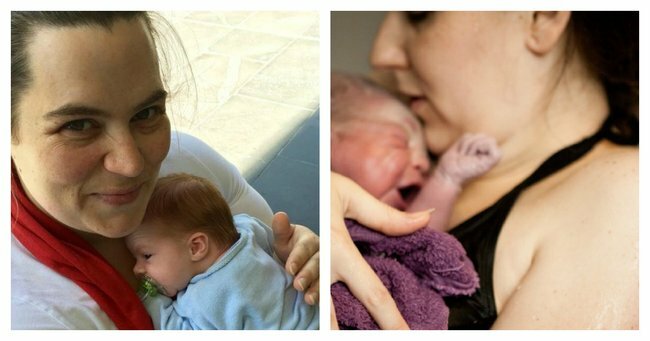 "Australian women deserve the right to choose a homebirth." You hear plenty of homebirth horror stories. At Mamamia we’ve reported a number of them ourselves; the tragic and preventable death of Caroline Lovell, the twin baby boy who died during a homebirth in Adelaide, Jessa Duggar was rushed to hospital because of post-birth complications, and Ruth Irorio’s near-death experience. The stories are tragic and newsworthy, so it’s right that they should be reported. But stories about successful homebirth experiences are few and far between. That’s fair enough. After all, who would read a story headlined: ‘Woman gives birth to baby and everyone was delighted.’ It’s almost as un-newsworthy as ‘Dog bites man’. But the unintended consequences of all that reporting of horror homebirth stories is that you might get the impression that giving birth is a neglectful, selfish thing to do. That’s not to say homebirth is for everyone. It’s not that either. But where a mother chooses it, and her caregivers can support it, homebirth is a rewarding, safe, comforting and empowering experience, and it’s one that needs to be better supported in the Australian health system. Almost five years ago, Sydney writer Jenn Davis, who blogs as Penny Poppleton, gave birth to her daughter, Piper at home. “We chose to have homebirths for a few reasons. One, I have anxiety around hospitals, doctors, and health care. It’s profound enough I feared that my births would stall or be miserable, so we weighed the risks and as my pregnancy was very low-risk and I was healthy, we opted for midwife-assisted delivery at home. Jenn: "I have anxiety around hospitals, doctors and health care. It&apos;s profound enough that I feared my births would stall or be miserable." Image supplied. Before Jenn went labour, she had anticipated that it would take around 12 hours. In the end, Jenn was in active labour for seven hours before Piper was born. "I had my husband and a close friend there with me. I couldn&apos;t see any of the &apos;hospital&apos; equipment - it was tucked just out of sight in the hallway. I was on my bed, with my pillows, my sheets, my comfy blankets, my familiar towels. Piper was born as I was on my hands and knees and I remember sitting back to gaze at her and thinking, &apos;Holy crap, I did it.&apos;"
Jenn&apos;s son, Owen was born at home two years later. "I don&apos;t know if my second birth was more rewarding. It was more painful, and I tore worse, and had a pretty serious haemorrhage, all handled fantastically by my midwife, but I think I was so ready to be done that I didn&apos;t enjoy the process as much." Jenn and her midwife had bookings at hospitals in case of emergency, both of which were a short ambulance ride away. British model and actress Lily Cole, has written publicly about delivering her daughter in a homebirth last year. "I am so glad my daughter&apos;s first experience of life - of that transition from womb to world - was a positive and gentle one," says Lily Cole. "Although I had to transfer to hospital after the birth, a homebirth meant I got to bring my little girl into the world in an intimate, private, sacred way. And I got to witness what my body is capable of." In Britain, homebirth is supported by the public health system and is available, to a certain extent, across the whole country. In Australia, unless you choose to free birth (a birth with no health practitioner in attendance) having a homebirth is an expensive option. "We paid about $4500 out of pocket for each birth, with some subsidised by Medicare. My midwife was, at the time, one of the only Medicare-eligible midwives in the country," Jenn Davis said. "It was only possible because we are relatively well off." Currently, in Australia because of a complex history and system of Federal Government regulation and the difficulty of obtaining insurance, midwives take on great personal risk if they attend a homebirth. "&apos;Adverse outcomes&apos; for babies are rare regardless of where mothers plan to give birth." Image via iStock. A midwife is authorised and insured to practice midwifery care at home in both the ante and post natal periods. However, while she is authorised to provide care during the intrapartum care (in simple terms, this is the period of labour and delivery of the baby) in the home, she carries the burden of liability if something goes wrong. And what are the chances of something going wrong? Well, the NHS references a birth place study and states on the NCT website that, "Giving birth is generally very safe for healthy women with a straightforward(‘low-risk’) pregnancy. ‘Adverse outcomes’ for babies are rare regardless of where mothers plan to give birth, occurring overall, in just 4 to 5 births in every 1000. These adverse outcomes are serious, or potentially serious events, but thankfully they are rare." If birthing at home is as safe for a woman with a straightforward pregnancy as it is for any other birth location, and if they are cheaper on the public purse as a hospital birth (which they are, requiring less staff, no catering or cleaning, no bed in a hospital etc.) and if they&apos;re publicly funded in Britain, then why not here also? It&apos;s a question of women&apos;s rights, the right of women to choose the location of their birth, the right of women to bodily autonomy and the right of midwives (who are more often than not women) to practice their profession with true collaboration from the heavily male dominated world of obstetrics. It&apos;s time for the Government to stop regulating women&apos;s choices and infringing on their rights by withholding a health care option that is as safe as any other birth situation. The last word belongs to Jenn Davis, who told Mamamia, "My favourite thing about having my baby at home was that afterward it was just us, just the three - then four of us. My husband didn&apos;t have to leave. I didn&apos;t have to sleep in a strange bed or worry where they&apos;d taken the baby, because she was just right there the whole time. "All of the anxieties I would have had were mitigated by being in familiar surroundings and that made it all worth it."